devAdInAm - aho rAtrANi; bhajet - pR^ithak kuryAt; vibhajate iti pAThe sUrya iti sheSaH; day and night are the basic factors to calculate time. And sun is credited to have devised day and night, if the text is read as vibhajate. Black-fortnight is day and white-fortnight is night for those manes... thus, if shraddha, yearly obsequial rites to manes, is to be performed, they are performed during black-fortnight, say days heading towards amAvAsya, no-moon-day, because it is the day time of manes, pitR^i devatA-s.. The manes residing in chandra loka cannot see the sun in white-fortnight because then the moon subdues the sun. In black-fortnight the moon and sun will be facing each other. Hence manes can see sun in that period. Hence white fortnight is said to be the night of manes and black one as their day. As such offering shraddha etc to manes is prescribed towards, or on amavAsya, no-moon-days. - Gita Press. While Sun transits from makara-saMkraAnti to mithuna-saMkrAnti, transit from Capricorn to Gemini, the rays of his chariot, as well as the rays of latitudes, akSAMsa-s, will be drawn everyday towards North Pole. ravi ratha akSa rashmyayoH dhruveNa AkarSaNe anudinam kriyamaANe uttara abhimukhaH sUryo, meru mUrthasthAnAm devatAnAm dR^ishyo iti bhavati... Thus the Sun transiting towards north will be seeing the devatA-s situated on Mt. Meru everyday. Therefore, northern solstice will become the day of devatA-s. The reverse is the situation when southern solstice begins, i.e., when Sun transits from karka rAshi, Cancer, to dhanurrAshi, Sagittarius, where the pull of his rays towards North Pole lessens everyday in phased manner, whereby the Sun cannot see devatA-s, slowly. Hence dakSiNa ayana, southern solstice, is becoming night for devatA-s. - Gita Press. The period of fortnight of manu-s is reduced to ten-day fortnight, unlike the fifteen-day fortnight of humans. H. H. Wilson raises a point in the footnotes on page 21, Vishnu Purana: The French translation has, "dix annees des dieux font un jour de Menu; dix jours des dieux font un pakcha de Menu," &c. The error lies in the expression "jours des dieux," and is evidently a mere inadvertence; for if ten years make a day, ten days can scarcely make a fortnight. sandhya, sandhyAMsha sankhya: total of intervening periods: 2, 000, two thousand years in total. In satya = 800; treta= 600; dwApara= 400; kali= 200 years. yuga-sankhya: total yuga-s are: 10, 000: satya= 4000; treta= 3000; dwApara= 2000; kali= 1000 years. These plus intervening periods will be 12, 000 years - true to the definition of that word yuga - dvAdasha sahasrii varSANi yugam iti ucyate - later called as catur yuga, because the word yuga is commonly applied to its inner periods - kali yuga, dvApara yuga etc. 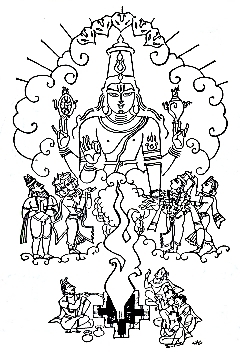 tat yugam eka saptatyA gaNitam kiMcit adhikam ca manvantaram prokatam; ayanam - etAvatA kAlasya ante manoH brahma lokam prati gamanenAdarshanam bhavati iti tadeva ayanam iti ucyate. Even manu-s have to go to brahma's abode to merge into brahma after sojourning in heavens. Each manu goes to heaven via dhumAdi mArga - southern path, stays there till the meter of merit is running, then before falling down from there, he ascends the northern path, goes to brahma's abode to merge in brahma, where this brahma is kAraNa brahma, i.e., nArAyaNa, not four-faced brahma. Footnote on p. 21, Vishnu Purana: ....a Manwantara, is equal to seventy-one times the number of years contained in the four Yugas, with some additional years: this is the duration of the Manu, the (attendant) divinities, and the rest, which is equal to 852.000 divine years, or to 306.720.000 years of mortals, independent of the additional period 6. Fourteen times this period constitutes a Brahma day, that is, a day of Brahma; the term (Brahma) being the derivative form. At the end of this day a dissolution of the universe occurs, when all the three worlds, earth, and the regions of space, are consumed with fire. All puraNa-s have to state these accounts as a respect offered to Time Principle, but no two purANA-s agree on these accounts. However, our predecessors have tried to decipher something out of these accounts. One such effort is that of H. H. Wilson in Vishnu Purana. In the footnote on page 21 of his translation there is a lengthy account of this, which can be seen in Sacred-texts.com site in its 37th chapter. This is to avoid dwelling much here on stanzas of similar nature, and for ready reference of readers. dvAdasha Aditya-s - twelve Aditya-s are originally not twelve suns, nor the twelve names of sun, where viSNu is also one among them. They are earliest self-luminous vedic entities emerged from hiraNyagarbha, which itself is a compact mass of dakSa and aditi. While these twelve Aditya-s sprang up to firmament, one more like them has emerged in Initial-Bang theory, but came out as a dead mass - mR^ita+aNDa, who later came to be known as mArtANDa. This period of thousand year night-time of brahma is also known as nishi of nArAyaNa, where nishi is not exactly a night, but some stopgap period of activity. Same measure of time is the day, say activity time, of nArAyaNa. It may be noted that prajApati-s will emerge out the concept called nArAyaNa on par with creator-brahma. So, they too are responsible for creation, say biogenetic creation. Thus, this is the eight chapter of first canto called harivamsha-parva, in harivamsha-purANa, the sequel of mahAbhArata, narrating the calculation of eras, time cycles. So that these periods resolve themselves into very simple elements: the notion of four ages in a deteriorating series expressed by descending arithmetical progression, as 4, 3, 2, 5; the conversion of units into thousands; and the mythological fiction, that these were divine years, each composed of 360 years of men. It does not seem necessary to refer the invention to any astronomical computations, or to any attempt to represent actual chronology. 'One and seventy enumerations of the four ages, with a surplus.' A similar reading occurs in several other Pur�ńas, but none of them state of what the surplus or addition consists; but it is, in fact, the number of years required to reconcile two computations of the Kalpa. The most simple, and probably the original calculation of a Kalpa, is its being 1000 great ages, or ages of the gods: ### Bhavishya P. Then 4.320.000 years, or a divine age, x 1000 = 4320.000.000 years, or a day or night of Brahm�,. But a day of Brahm� is also seventy-one times a great age multiplied by fourteen: 4.320.000 x 71 x 14= 4.294.080.000, or less than the preceding by 25.920.000; and it is to make up for this deficiency that a certain number of years must be added to the computation by Manwantaras. According to the S�rya Siddh�nta, as cited by Mr. Davis (A. R. 2. 231), this addition consists of a Sandhi to each Manwantara, equal to the Satya age, or 5.728.000 years; and one similar Sandhi at the commencement of the Kalpa: thus p. 25 4.320.000 x 71 = 306.720.000 + 1.728.000 = 308.448.000 x 14 = 4318.272.000 + 1.728.000 = 4320.000.000. The Pauranics, however, omit the Sandhi of the Kalpa, and add the whole compensation to the Manwantaras. The amount of this in whole numbers is 1.851.428 in each Manwantara, or 4.320.000 x 71= 306.720.000 + 1.851.428 = 308.571.428 x 14 = 4319.999.992; leaving a very small inferiority to the result of the calculation of a Kalpa by a thousand great ages. To provide for this deficiency, indeed, very minute subdivisions are admitted into the calculation; and the commentator on our text says, that the additional years, if of gods, are 5142 years, 10 months, 8 days, 4 watches, 2 Muh�rttas, 8 Kal�s, 17 K�sht́h�s, 2 Nimeshas, and 1/7th; if of mortals, 1.851.428 years, 6 months, 24 days, 12 N�ris, 12 Kal�s, 25 K�shtshas, and 10 Nimeshas. It will be observed, that in the Kalpa we have the regular descending series 4, 3, 2, with cyphers multiplied ad libitum. In theory the Kalpas are infinite; as the Bhavishya: 'Excellent sages, thousands of millions of Kalpas have passed, and as many are to come.' In the Linga Pur�ńa, and others of the Saiva division, above thirty Kalpas are named, and some account given of several, but they are evidently sectarial embellishments. The only Kalpas usually specified are those which follow in the text: the one which was the last, or the P�dma, and the present p. 26 or V�r�ha. The first is also commonly called the Br�hma; but the Bh�gavata distinguishes the Br�hma, considering it to be the first of Brahm�'s life, whilst the P�dma was the last of the first Par�rddha. The terms Man�, or great Kalpa, applied to the Padma, is attached to it only in a general sense; or, according to the commentator, because it comprises, as a minor Kalpa, that in which Brahm� was born from a lotus. Properly, a great Kalpa is not a day, but a life of Brahm�; as in the Brahma Vaivartta: 'Chronologers compute a Kalpa by the life of Brahm�. Minor Kalpas, as Samvartta and the rest, are numerous.' Minor Kalpas here denote every period of destruction, or those in which the Samvartta wind, or other destructive agents, operate. Several other computations of time are found in different Pur�ńas, but it will be sufficient to notice one which occurs in the Hari Vanśa, as it is peculiar, and because it is not quite correctly given in M. Langlois' translation. It is the calculation of the M�nava time, or time of a Menu. = a day and night of a Menu. Accordingly the commentator says 72000 divine years make up his year. This is according to Vishnu Purana. Here it is eka saptatyA, seventy-one divine years.